1. I love it when I CRAVE some yummy greasy tacos from the Quantico PX or maybe a chicken fajita burrito from Chipotle but then I remember I'm in Jville and they don't have CRAP to eat here. Love that. 2. 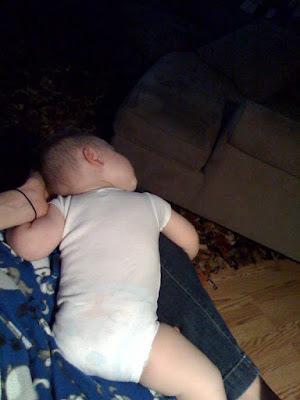 I love it when my sweet baby boy falls asleep on my leg while I'm blogging. 3. Or when I try to take a different view of his precious cheeks but instead I show the world that I'm wearing that stupid shirt again. I hate that shirt. I think I'm gonna burn it or maybe give it away in a blog contest so one of YOU can wear it from now on. "Let the sisters take care of themselves and make themselves beautiful, and if any of you are so superstitious and ignorant as to say this is pride, I can say that you are not informed as to the pride which is sinful before the Lord, you are also ignorant as to the excellency of the heavens, and of the beauty which dwells in the society of the Gods. Were you to see an angel, you would see a beautiful and lovely creature. Make yourselves like angels in goodness and beauty." 4. I love being able to eat onions and have garlic breath and not have to worry about making out with anyone later that night. hah. 6. I love opening all the blinds on all the windows downstairs first thing in the morning and feeling happy with the sun shining in my house. 7. I love it when my lover does a FREAKIN awesome job on his mock trial and he's DONE with NJS drama. Go babe! 8. I love it when I almost get hit by a car that ran a stop sign and then they flip ME off. That's hot. 9. I love it when Amber's stool softener pills she gave me hit at the most inopportune time and I find myself on the toilet with a baby on my lap and Kora on the floor while I help her with her homework. TRUE motherhood right there. Perfect "love it" for number 9. 10. I love it when my FIL calls me all day long because he has "questions" but really I know he just loves talking to me. Love ya Pops. 11. I love it when I let my two big kids watch Twilight and now they're obsessed with vampires. 12. 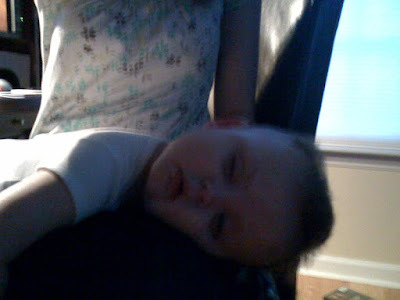 I love it when Isaak puts like 6 black fireplace rocks in his mouth and he smiles at me with cheeks full of rocks. 13. I love it when annoying people spam my comments for "votes" on their stupid story that isn't even funny and then when they're confronted about it they tell me that all Mormons should be kind loving and happy. What the crap? Just cuz I'm Mormon means I can't be annoyed? Is that part of the 13 Articles of Faith. We belive in not being annoyed with spammers? If that's the case I got lots of repenting to do. 14. I love it when old friends comment. Ones I didn't even know read my blog! Hey Katherine DeSa! Thanks for the comment. Email me!! My address is on my sidebar. I feel a TBS dinner party reunion coming up...my place...lots of food....lots of fun! 15. I love it when I have nothing to REALLY blog about but I want comments because they make me happy to see emails in my inbox so I make a list of "I love it's" for you to waste your time with. 16. I love it when blogger won't let me put spaces in between my list of numbers so it makes my list look 20 times longer and more annoying than it really is. Stupid blogger. I love the "love it's" and your voicing of your opinion. You are quite interesting and I always check to see when you have posted again. I HATE STOOL SOFTENERS! But I understand, the awkard moments. Isaak is so cute.. and the spammers, I think they notice you get a high dose of traffic. Funny story, a girl at work I introduced to blogging, she don't know mine, but created hers, found your page and was talking about how it's funny she used to live in Texas, then in Woodbridge, now in Jacksonville, and that she loves your page. Girl, you have become a BLOG ICON! I think they should pay you for that. BTW - I hate that your hair was ABSOLUTELY perfect in those pics with Candace :( My hair is sooooo ugly! And this list.. fabulous.. why do you hate that shirt? It's super cute! We love comments too. You have an amazing ability to make normal, everyday "stuff" sound interesting. You have an amazing ability to get your "stalkers" to step out of the dark and make themselves known. We know we have numerous people that follow our blog, but rarely, rarely to they ever leave comments. So, be grateful for evey one!!! We love reading about all the fun, cute things your kids do and all the adventures they take you on. Thanks for inviting us along in all the fun! I'm just posting because you like the attention. But I, too, enjoy the randomness and freakish ability you have to entertain with the most banal of topics. I really enjoyed this list and I especially loved the picture of yummy Izey cheeks. What does banal mean? I need to look that up. -Brigham Young -- smart guy, love him! -Home Alone -- such a great break sometimes, sorry husbands, you rule but your high maintenance. To comment on the rest of your 'loves' would totally give into your #15. I have like 20 hundred other things to do today so I am checking out. lates. i love onions and garlic and don't really care if luke has to smell it...unless it's the morning AFTER i eat the 2...then i feel like a cat pooed in my mouth and even III don't like the smell or taste, so it has to be rank. i wear the same shirts over and over again too. i don't think anything about you wearing the same shirt, except that you mention it every time, so it makes me laugh. at least it's a cute shirt, mine are old college t's. not cool. i need more clothes. I love how you don't really LOVE all of them... it's kinda confusing!